One of the main responsibilities of the shepherds of a local church is to feed the flock. What does this involve? 1. A biblical diet, not a provision of pastoral personality – Some pulpits have degenerated into a weekly opportunity for the flock to enjoy the pastor’s eloquence or humour. He may be a godly man, an inspiring man, a kind man, or whatever, but his job is to point the flock to the Word of God, not his own brand of pious oratory. 3. A cumulative diet, not a hodge-podge of unordered repetition – Some churches get to digest a diet that has no cumulative structure. That is, each Sunday the pastor or varied speakers offer whatever they feel led to bring on that Sunday. Again, there is place for space in the schedule – buffer weeks to allow for teaching that was unplanned months before but is on target in the moment. However, when churches lean too much into this approach what they end up getting is not a balanced diet, but an overload of certain favourite subjects and passages. Repetition can become the name of the game. 4. A healthy diet, not a toxic overload of fast food entertainment – Listeners love to have itching ears scratched with entertainment, experience and surface level applicational teaching. The shepherds of a church need to recognize that the sheep may not know what is best for their diet. Too much sugar will poison a person, and too little healthy teaching will do profound damage to a church. 5. A Christ-focused diet, not a pseudo-Christian selection of self-help nibbles – Building on the previous point, people love to nibble on self-help top-tips wrapped in Bible stories and garnished with proof texts. However, if the preacher is pointing listeners to themselves, to their efforts, to their application, to their discipline, then that preacher is not primarily pointing people to Christ. The preaching may feel very churchy, but is it actually Christian? Feeding the flock is an important responsibility. Let’s look at our own preaching, as well as the preaching plan for our churches. Let’s prayerfully consider whether we are offering health to our listeners. Like a good parent you won’t be able to serve up a feast at every meal, but you will look to offer health at every opportunity. The Resurrection is at the very heart of the Christian faith. After Jesus died in our place, bore the penalty for our sin, triumphed over the forces of evil and revealed the humble and sacrificial love of God for the world to win our hearts and our trust, then on the third day he rose from the dead: conquering death, vindicating the sacrifice for sin, and establishing a new hope for us all. What is that hope? Since Jesus is the firstfruits from among the dead, there is the promise of more resurrection to come – ours! Because of Easter our lives are changed. We are no longer under condemnation, because Jesus was condemned in our place. We no longer fear death, because Jesus has proven that death is defeated. We are no longer living in darkness and confusion about God, because we know just how much he loves us, how far he would go to redeem us and how absolute is his victory over all that is against us. But as another Easter comes and then fades away, I wonder if the present implications of the Resurrection have gripped me as they should. I can look backward and forward, upward and outward, but are the Easter effects leaving the present me essentially untouched? That is, I can think back to the first Easter, forward to the return of Christ, upward to heaven and outward to the world, but what about me here and now? What difference does the Resurrection make to me, now? Certainly, Easter is a past historic event with glorious implications for my future experience beyond death in this world. Of course, Easter means that I have the certain expectation of being accepted by God rather than condemned, and it gives me a message to share with a needy world around me. But is Easter all about past and future, heavenly status and evangelistic witness? In what sense is my moment by moment experience of life marked and shaped by Easter? Is the present effect just gratitude for heavenly blessings and my hope for the future? Has Easter just changed my standing before God, and my ultimate destination beyond this life, but left me essentially a grateful anticipator of a better future? Or has Easter actually done something in me now, something more than just stirring gratitude and hope, important as both surely are? When John the Baptist announced Jesus’ arrival he pointed to two aspects of his mission. Jesus was “the Lamb of God, who takes away the sin of the world” (John 1:29). And Jesus was also “he who baptizes with the Holy Spirit” (John 1:33). This is shorthand for the full expectation of the New Covenant promises in the Old Testament – Jesus was the one who would deal with our guilt, paying the penalty for it and carrying it away that we might be free of condemnation. And Jesus was the one who would bring about an internal change in us by giving us the Holy Spirit to stir a new liveliness to God within us as our hearts are transformed and we enjoy not only the new status of being forgiven, but also the new experience of being adopted into God’s family. Later in John’s Gospel Jesus makes it clear that his departure would make possible the coming of the Holy Spirit (John 16:7), and subsequently reveals in prayer what eternal life actually is: “that they know you, the only true God, and Jesus Christ whom you have sent” (John 17:3). To be truly alive we need not only to have our guilt forgiven, but also to experience the very life of God himself, which is only possible through the renewed presence of the Holy Spirit in us. After Jesus rose and later ascended, we come to Acts 2 and Peter’s explanation of the apparently drunken behaviour of the believers. This was not drunkenness, this was the promised pouring out of the Holy Spirit. How was this possible? Because Jesus who had been crucified did not remain in the tomb, but rather than experience decay he rose and now was able to give the Holy Spirit. For Peter, the giving of the Spirit was only possible because Jesus had not remained in the tomb. Is that life that the Spirit gives simply a future grant, or is he speaking of a present tense new gift of life? Doesn’t the fact that Jesus is alive today mean that I am not living my life alone, but in fellowship with him? Do I not get to join Jesus in his mission to the world, and in his relationship with his Father? When Dr Martyn Lloyd-Jones wrote about Romans 8 he referred to our union with Christ as “the ultimate doctrine.” How true this is! When Jesus rose from the dead it was not simply to prove that the offering had been accepted, nor to simply demonstrate victory, nor to just establish hope, also it was also to make possible our present union with him by the Spirit. The Resurrection of Jesus has massive here and now implications! Because Jesus rose from the dead that first Easter, it means that I can enjoy relationship with him now, not just in the future. Because he rose from the dead I can know not only that my status is changed in heaven’s records, but I can know the love of heaven now, as it is poured out into my heart by the Spirit that has been given to us (Rom.5:5). Because Jesus rose from the dead, I don’t just speak to needy folks out there, I can also see the stirring of my own heart in the daily experience of union with Christ. This Easter let’s celebrate all that the Resurrection of Jesus means for us, not only in our anticipation of the future, but also in our experience in the present. Maybe your new year Bible resolutions have already started to fade? What we really need this year is not a renewed habit. What we really need is to unleash God’s Word into our lives and experience all that God wants to do in us. If our experience of interacting with God in our Bible times is going to really count for anything, then it has to be in the context of real-life struggles that the Bible has something to offer us. Psalm 143 is a great passage to ponder as we think about our Bible experience this year. It starts where life is at its toughest, then goes on to describe David’s experience in such an illuminating way for us. Actually, Psalm 143 is not one of those passages that speaks directly about the Scriptures. What it does is speak of David’s experience, which can also be our experience as we engage with God through the Scriptures. In the first four verses David is crying out for God to answer his prayer, but to do so in faithfulness and mercy. He doesn’t want God to be acting as judge, otherwise he, like all of us, would be in real trouble. David is troubled by his own sin, and also by opposition from the enemy (see v3). Verse 4 describes a wiped out David – a man with nothing left to give. Sometimes that is where we find ourselves: either through our own sin, or the opposition of the enemy, we feel like we have had the stuffing knocked out of us and our spirit faints within. David writes that his heart is devastated, or laid bare. He feels like he has nothing left to give. And so what do we do when life hits us like that? Where do we turn? Do we look within, or turn to a philosophy, or throw ourselves into a career or hobby, or perhaps just numb the pain with a substance? The world really has nothing to offer us. Of course, as we all know, we should turn to God. And so from verse 5 David’s experience is described in such a way that it can reflect what our experience could be as we engage with God through the Bible. I want to share five things that unleashing God’s Word into our lives might bring this year. Before I do, a comment about Bible character envy. Perhaps you struggle with this envy at times. It goes like this: if I had David’s experience of defeating Goliath, or heard God’s voice on the mountain as Moses did, or met with the LORD as Abram did, then I would not struggle in my spiritual life today. Really? Perhaps we could reverse the situation. Imagine we could travel through time and organise a conference for all the Bible characters to attend. Imagine we could tell them that after their time, in the future the Messiah would come, and then his followers would write more books, and then all the books from the Law, the Prophets, the Writings, and the apostles, would all be gathered together and freely available in many languages. I suspect that would be a room full of Patriarchs and Kings and Prophets who would be jealous of us! So what does unleashing the Bible into our lives offer us? 1. We are rooted in the reality of God’s greater story. In verse 5, David speaks of memory, meditation and musing on God’s past activity. He had his own story, and he had the stories passed down from his ancestors. And as we read our Bibles we will be lifted out of the one square metre of our own experience and struggles. We will be reminded that we are part of a much bigger story that stretches across all centuries and all continents, from eternity past to eternity future, a story that is being written by God himself. We need that because life has a habit of sucking us into the vortex of our own struggles. 2. We are reminded that our greatest need is God. In verse 6, David describes his awareness of his own great need. His soul was like a parched land desperately thirsty for God. Even in our greatest struggles, we have an innate ability to assume we are just being unlucky. If God would just give us that promotion, or a lucky lottery ticket, or a perfect spouse, or a new spouse, or a new job, or whatever … if we could just get a fair set of circumstances then we would be able to succeed in life. Really? When we spend time in God’s Word we are reminded that actually what we need is not financial or circumstantial, it is profoundly spiritual. We need God. Desperately. 3. Our responsiveness to God is stirred by His steadfast love. In the beginning of verse 8 David refers to God’s steadfast love – perhaps the key theme of the Old Testament. You can find references to this proactive, selfless, loyal love on page after page of the Psalms. And as we read the Bible we are stirred to respond to that love as we see God’s faithfulness to his people, God’s self-giving for those he loves. We cannot work up faith within ourselves, but as we glimpse God’s steadfast love, then a response of trust is stirred within us. 4. We are redirected to live our lives by God’s good Spirit. The second half of verse 8 speaks of being shown the way to go. In verse 10 David asks for God to teach him to do God’s will, and for God’s good Spirit to lead him on level ground. When we are convinced of God’s favour toward us then the next step is not only trust, but also obedience. It may be that unleashing God’s Word in your life this year will mean God takes you to levels of obedience you never thought possible. Maybe areas of your life that you have tried and failed to fix, and now are ingrained in your rhythms of life, and you feel defeated and resigned to living with the secret shame…maybe that is where the light of God’s Word might shine in the coming days! Trust Him, and be willing to obey. 5. We are revived by our encounter with God. In the final two verses, David is clearly concerned about his life. So the request is translated as “preserve my life” in verse 11. Essentially the “preserve” is supplied by the context, but what he asks for is life. Whether asking for preserved life or revived life, God is the right person to be asking. As we engage with God in His Word, the deep cry of our parched souls for life can be answered because God is a God of steadfast love toward us. Don’t make this another year of Bible reading as an attempted habit. Make it a year in which you unleash God’s Word into your life and you encounter God in the Bible as never before! 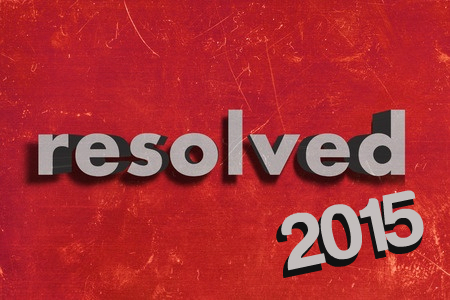 Here’s another resolution to throw into the mix as we head into another year. How about making a prayerful determination to preach Christ, rather than the tempting alternatives? 1. Don’t preach issues – It is tempting to be contemporary and to buy into the idea that what people really value above all else is contemporary relevance. Of course the Bible is relevant and Christ is relevant, but that doesn’t mean your preaching should be salted with relevance like meat in a medieval barrel. Some preachers are so concerned about being up-to-date that they lose sight of what they have to offer those sitting before them. Relevance is important, but it is not the primary and central goal in preaching. 2. Don’t preach tips – Of course God’s way is the best way and lives gripped by the Gospel tend to work a whole lot better than lives lived according to the values of the world. And yes, the Bible does include a lot of insight into living life, both legitimate and moralized. But our job is not to be the weekly top tip provider for a people totally absorbed with successful living. There should be a huge difference between our preaching and the self-help guru folks may pay a fortune to hear on Friday night. The gospel will transform lives, but we are not called to be known as life coaches. 3. Don’t preach pressure – With all the best intentions we can easily undermine the work of the Gospel in the lives of those we preach to each week. That is, we want them to be thriving spiritually and in life. We know the damage sin can do. So we will always be tempted to twist arms and pressure people to conform to an outward Christianity. It makes church life easier if all messes are hidden and people act appropriately. But pressure preaching assumes that listeners can fix themselves and that we can achieve God’s goals without any meaningful involvement from Him. There will be moments where we seek to appropriately apply the pressure of God’s Word, but that is not what defines us as true Christian preachers. 4. Don’t preach yourself – Over the years our own flesh has this amazing ability to get used to being the centre of attention. If you are naive enough to believe the polite comments you receive after preaching are objective evaluations of your ministry significance, then you can easily start to buy into your own hype. Please don’t. 5. Do preach Christ – The Gospel is not a self-starting life-change program, it is good news that involves us introducing listeners to God in Christ. Don’t preach self-help programs, or church programs, or Christian morality, or even Christianity . . . preach Christ. Make 2015 a year marked by a weekly introduction to a heart-capturing Saviour! As we come to the end of another year, it is good to look back and take stock. Be careful though, it is easy to do this in a way that isn’t helpful. As you look back, don’t emphasize things like ‘what fruit has my ministry produced?’, or ‘which was my best sermon?’, or ‘whose life has changed the most under my ministry?’ These kinds of questions put your focus entirely on yourself. Negative versions of the same questions still do the same. 1. What am I thankful for in respect to the opportunities I have had to preach? Whether you have preached a couple of times, or a couple of times a week. Whether it has been to one church, or to multiple groups, give thanks. 2. Where have I seen prayers answered in respect to my preaching? Take time to reflect on prayers answered as you look back over the specific preaching opportunities you have had. Were there some challenging sermon preps that came together as you prayed? Did certain people hear certain messages? 3. Where might my prayers have been answered without me knowing during this year? This is the important impossible one – what might have happened that you don’t know about? A lot. Ponder and pray about that. 4. 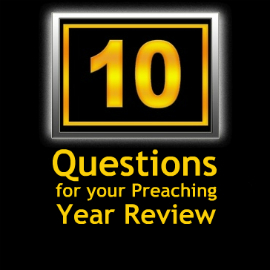 What sermon preparation has most stirred my heart during this year? A specific text, or a certain series? 5. What lessons does God want me to learn from what has happened this year? Lessons about preaching, about life, about ministry, about yourself, about Him? 6. What life change have I seen that I can give thanks for? It could be gradual or sudden, salvation or growth. Give thanks for the privilege of being a part of what God is doing! 7. How has God protected my integrity during this year of ministry? You could be out of the ministry right now. How has God guarded you from that? 8. How has my intimacy with Christ developed (or faded) during this year? Don’t automatically self-evaluate. Ask God to search your heart and show you His perspective on this. 9. What should I be thankful for in terms of provision to allow my ministry? Whether it is paid employment that allows you little time to prepare, but pays the bills, or ministry-related income that makes it possible . . . give thanks. 10. Is there anything else that I should give thanks for as I finish my review? Family support? Key friends? A mentor? A preacher you look up to and learn from? A book that has helped? Challenges that have shaped you? Take time for God to bring to mind whatever has been missed in the earlier questions. Gratitude is the critical ingredient in a truly faith-driven ministry. Give thanks. 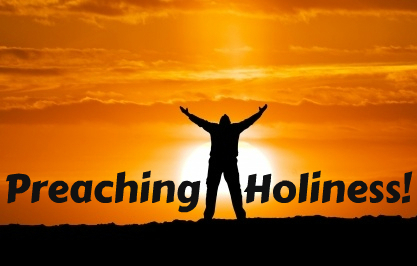 This week we have been pondering the preacher and the theme of holiness. There is so much more that could be said about each point, but hopefully we have had something to think and pray about. 16. When we make holiness sound like sour pickled vegetables we don’t motivate anyone to think beyond this life. The New Creation will be wonderful in many respects, not least because of the total absence of sin and pain and tears, as well as the presence of Christ Himself. Too many in our churches still have lingering images of sterility and fun-free hymnathons. The Bible gives a lot of future glimpses to motivate us in the present. 18. The great threat to holiness in the church is not just the worldliness of culture, but also the pseudo-holiness of church culture. Just as a weekend of binge behavior in a degraded society is horribly empty, so too is a relationally empty performance devoid of meaningful engagement with God and others (sometimes polite conversation can be empty too). 19. Preaching for holiness cannot be restricted to applications of conduct, nor even of conforming the mind…it must seek to engage and stir the heart. It is not what goes in from the outside that defiles a person (i.e. religious duties and traditions), but what spews forth from the heart. So preach in such a way as to engage the heart. Informing the mind and pressuring the conduct will never suffice when the heart of the problem is the, uh, heart. 20. The overwhelming use of the term “Holy” in the New Testament is in reference to the Spirit of God. Let’s be sure that our preaching is pursued with a thoroughly biblical and growing understanding of the role of the Holy Spirit in respect to our sanctification. Too much Christianity still ignores the Spirit or turns Him into some sort of battery pack (either highly visible or highly invisible). It is by the Spirit that we are united to Christ. True relationally rich holiness is our privilege in the Gospel! 21. If you long for greater holiness in the lives of people in your church, don’t preach for “holiness.” Instead, pray and preach for spiritual vitality in their relationship with Christ. If we, and they, will love God, then what we want to do will be profoundly holy. The Gospel does a work on our wants! So much more could be said, but let’s pray for the beauty of God’s holiness to pervade our lives, our ministry and our churches . . .
5. The Gospel is not just a solution for the guilt of our un-holiness, it also includes a recipe to generate true holiness. Often preachers offer a way to get rid of the guilt, but leave listeners feeling that the pursuit of holiness and their ongoing commitment to Christ’s cause is a burden planted firmly on their shoulders. The Gospel isn’t simply about forgiveness of sin, it also includes the transformation of the human heart and the wonder of union with Christ by the indwelling Spirit of God (the Holy Spirit). 6. The compulsion stirred in a Gospel-gripped heart is infinitely stronger than our most vehement tirade. We will always be drawn to the notion that our pressurized guilt trip will bring about change, but only because we don’t fully understand humans or the Gospel. Peer and preacher-pressure may manufacture diligent religious duties, but a delighted heart will give anything for the One loved. Preach Him that others might love Him. 7. Show me a heart that truly loves Christ, and I will show you a life that is growing in holiness. If the people in our churches could just catch a glimpse of the wonder of God’s pure love in Christ then the result would be incredible growth in holiness. Our privilege is to seek to know Him more and offer Him more effectively. 8. True holiness momentum comes not from the pulpit, but from the stirred heart. So preach and present the One who stirs hearts. Our task is not primarily to instruct and constrain. It is to present and invite. Offer the most compelling Christ that you can and you will barely scratch the surface of the richness of the One who for all eternity has brought infinite delight to the heart of the Father in heaven. We could always do better at preaching Christ. Let’s stop wasting time and energy preaching performance and give ourselves to the Christian minister’s great privilege. 9. What spills from the preacher’s heart on Sunday must first thrill the preacher’s heart during the week. If our lives are too caught up with the business of the church enterprise instead of prayer and ministering the Word, then we may give leadership speeches, but we won’t be preaching Christ out of the overflow of our own hearts. In this sense, holiness momentum is generated via the pulpit, but the starting point is private delight in the wonder of Christ. Continuing a quick jaunt through Andy Stanley’s guidelines for preaching to unchurched people, from his chapter on preaching in Deep and Wide. Guideline 4: Give ’em permission not to believe . . . or obey. Like you, I’ve heard way too many messages addressed at nonbelievers that were full of salt seasoned with grace. That’s part of the reason so many unchurched people are just that: unchurched. I think we would be wise to extend Paul’s advice to our preaching. When addressing unbelievers, it should be all grace with just a pinch of salt. So while there are expectations of believers, non-believers should be given an out. They are welcome guests, but they are not the target of instruction. And when they are given an out, then they may well lean in to discover more of how things work within this family they are visiting. In fact, they may even respond to invitation. But if they feel like they are being judged, critiqued, attacked or commanded, then there is a good chance their response will be less than favourable. The next one will need more than the word count I have left, so I’ll keep you hanging until tomorrow, but it should provoke some thinking! To start the week, I’ve posted over on the Cor Deo site. What happens when we leave Christ out of Christianity? Click here to go to the post. I have been blogging about the basic requirement that preachers should themselves evidence growing fruit of the Spirit in life and ministry. It is a disaster when the truth of the gospel is undermined by a perceived lack of Christlike character in the preacher. So we’ve gone through the fruit of the Spirit in pairs, but we skipped the first. Or did we? Perhaps the four pairs lay out what that first fruit looks like. It shows in the joy that comes from resting in the goodness of God, and the peace of healthy ordered relationships with God and others. It is patient in trusting God’s work in the lives of others who often need longer than we feel is necessary (just as we do too! ), with a kindness that is giving for the good of those also still in process. It has an inherent goodness that reflects the profound quality of God’s character, as well as the gentleness that is fitting for someone reflecting God’s manner of authority. It has a faithfulness that speaks of both trusting and persisting for that which is good and right, while always retaining the appropriate self-control of a life lived in the desires of the Spirit rather than the impulses of the flesh. We have had several interrupted nights in a row as a virus has worked through our family. The loss of sleep does add a certain strain to daily life! Under pressure, does the fruit of the Spirit show? I’m sure I am not the only one who wishes it showed more. But the solution isn’t to strain in my own effort to look good under pressure, the solution is to grow as one walking in step with the Spirit. I hope that my preaching next week, next year, in twenty years time, will show a more Christlike personality than it does now. I’m sure I’m not the only one.